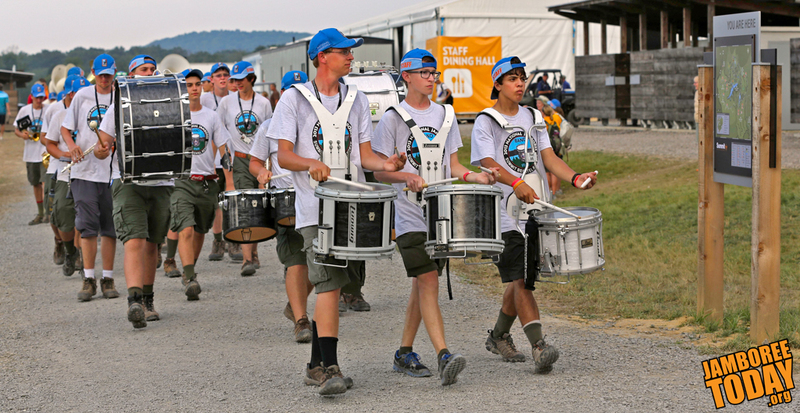 The National Scout Jamboree Band performs in Camp Echo. BSA photo by Trey Spivey. From their perch aside Goodrich Lake and the gleaming AT&T Summit Stadium stage, the 2013 National Jamboree Band is sending melodies and harmonies swirling through the Summit Bechtel Reserve as they practice for performances during the jamboree. Their big show is scheduled for this afternoon as part of the stadium show. "They'll hear us, just listen for the music," says associate band director David Mruzek of Hanover, Ind. The band, composed of 65 youth staff musicians who were accepted based on letters of recommendation from home school band conductors, is lead by a staff of five directors. They have been traveling around the Summit activity areas to play a variety of tunes, says Mruzek. "I love music and being here. The musicality and camaraderie impacts me a lot," says trumpet player and Maya Garcia, Venturing Silver Award recipient from Poqouson, Va. She has been playing trumpet for six years. Eagle Scout Michael Christie of Buffalo, N. Y., says he was looking through jamboree staff positions and "saw band, and I was, like, 'Yes!'" He has been a trumpeter for 11 years. "I mean band is my life, "says Christie. "It's great, I love it,"